To improve identification and treatment of mental disorders in youth. At month 6, 235 patients were very involved and 3 were moderately involved, while 236 family members were very involved and 2 were moderately involved. At month 12, 132 patients were very involved and 131 family members were very involved. At month 15 all 155 participants contacted were very involved. This two-year innovative intervention in the rural and post-conflict region of Jammu and Kashmir, India, aimed to improve mental health services provided to youth. The main obstacle in providing basic mental health services and reducing the treatment gap in LMIC countries are lack of access and resources. To circumvent this and to meet the project’s overarching objective, effective and affordable community-based care and rehabilitation was provided, effective treatments for use by non-specialists, including Lay Health Workers was developed with focused but brief training, and mobile and IT technologies was developed to increase access to evidence-based care. 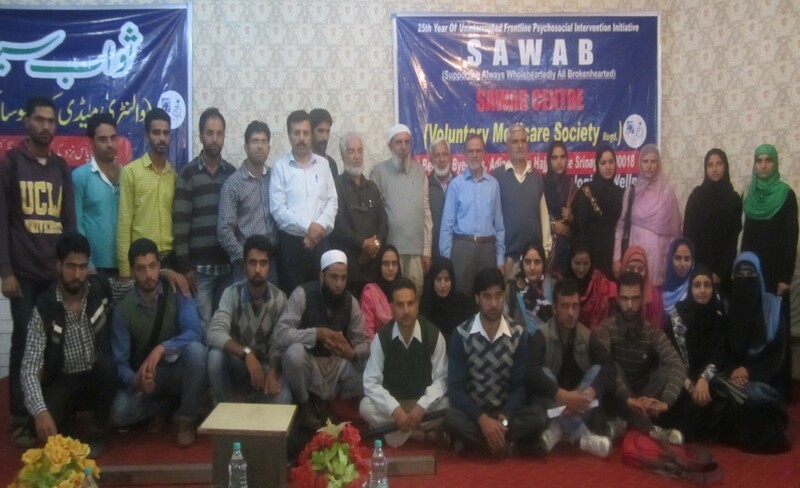 Collaboration with an already well-established and reputable voluntary organization, SAWAB (in Kashmiri this term refers to doing a good deed for the benefit of others) representing the only mental health service provider in the region greatly facilitated the integration with existing medical and pastoral systems (imams, local self-government leaders, etc.) and improved early detection and the timely delivery of mental health services to an underserved population. Request supervision from mental health professionals when deemed necessary. Once LHWs identified potential patients with the help of a stakeholder in the community, they arranged for consultation with a psychiatrist within 15 days. If needed, medication was provided free-of-charge and prescribed by psychiatrists along established guidelines. Pathways to care and time from onset of illness to referral were recorded for all patients. Patients functioning and symptoms were assessed throughout the project using three published scales. Quality of life, satisfaction with services and engagement of patients as well as their family members in treatment were also recorded. Watch the video with Dr Ashok Malla on Mental Health in rural Kashmir. Training LHWs that have limited experience and knowledge of youth mental health render this innovation cost-effective. Enlisting support from local imams and faith healers, school teachers, community elders, local self-government leaders and community health care personnel promotes mental health literacy and awareness as well as facilitates rapid access to mental health services. Collaborating with SAWAB was important for the success of this program as it provides limited but crucial mental health services in the region and therefore, has developed an extensive network of contacts facilitating much needed community mobilization, in a region where there is little or no access to governmental mental health care services. Where cellular networks are unavailable and to further scale-up our services, the feasibility of mobile tele-psychiatry (bus-mounted clinics equipped with very small aperture terminals for satellite connectivity) was examined in consultation with SCARF (Schizophrenia Research Foundation, India), who have deployed similar infrastructure with support from the Indian Space Research Organization. Moreover, the research team sought to expand the scope to other districts of Jammu and Kashmir, especially long term refugees from the valley of Kashmir to parts of the state outside the valley (Jammu) as well as to elicit broader and deeper interest from larger corporate entities such as cellular network service providers. ~$300,000 USD funded over two years by various funders. Socio-demographic variables at baseline: Information regarding gender, age, marital status, language spoken, highest level of education, employment status and diagnosis was recorded for each of the 262 patients at baseline. After 15 months 205 patients remained engaged. The demographic makeup of the sample has not changed significantly since the beginning the study. Lay health workers: LHWs were recruited in August 2014 and included 16 females and 24 males all of which at least 21 years of age. The group attended a face-to-face training until mid-November 2014. Following training, LHWs were tested on key learning concepts using a 60 questions true/false questionnaire and 4 case scenarios depicting various mental health presentations. Post-training evaluations were completed by each LHW in February 2015 with an average score of 83%. Treatment engagement: After 12 months, 23 patients (9%) had dropped out of the project. The assessment of patient and family engagement by LHWs revealed that at month 6, 235 patients were very involved, 3 were moderately involved while 236 family members were very involved and 2 were moderately involved. At month 12, 132 patients were very involved and 131 family members were very involved. At month 15 all 155 participants contacted were very involved. Clinical outcomes: The Global Assessment of functioning (GAF) scale was used every month during a one-year follow-up to assess symptoms and functioning. The results of the repeated measures ANOVA indicated a significant improvement over time, Wilks’ Lambda = 0.73, F (12, 120) = 126, p < .01, η2 = 0.93. Follow-up comparisons revealed that pairwise comparison between all-time points and 1 year follow-up was significant, p < .01. Subsequent analysis using MANOVA with gender and marital status as fixed factors revealed that functioning as measured by the GAF was moderated by both factors at all time points. Jones PB. (2013) Adult mental health disorders and age of onset. British Journal of Psychiatry, 202, s5-s10. Collins PY et al. (2011) Grand challenges in global mental health. Nature, 475, 27-30. World Health Organization. (2008) The global burden of disease: 2004 update. Saraceno B et al. (2007) Treatment and prevention of mental disorders in low-income and middle income countries. Lancet, 370, 1164-1174. Patel V et al. (2007) Treatment and prevention of mental disorders in low-income and middle-income countries. Lancet, 370, 991-1005. Margoob MA. (2006) Community prevalence of adult post-traumatic stress disorder in South Asia-Experience from Kashmir. JK-Practitioner, Spl 1, 13, S18. It is quite heartening to see that having demonstrated the feasibility and utility of this successfully concluded low-cost skill-transfer based, technology-enhanced mental health service delivery model, major stake holders in the region here are contemplating to scale-up our model to meet the needs of conflict-ridden other parts of the State of Jammu and Kashmir and cover larger range of mental health problems. Worthwhile to mention here and as is also well recognised to put the design of context-specific interventions in emergency settings in picture, the mapping of the problem is of vital important. Besides its geo-social context including rural and mountainous nature of parts of our catchment area posing some logistical risks, non- threatening and humanitarian nature as a non-partisan service provider to benefit the society at large, lessened the risks to the functioning of the project in the context of a political conflict with heightened suspiciousness and insecurity prevailing all around. Since WHO and other prominent humanitarian organisations have accumulated vast amounts of evidence to show that the provision of mental health and psycho-social support services in emergency settings at the community level needs to be participatory in nature strengthening coping mechanisms not only to improve people’s daily functioning and well being, and protect the most vulnerable from further adversity, but also to empower the affected people to take charge of their lives as valuable members of society. So some other endeavors being carried out by our team to strengthen the community psychosocial empowerment through social entrepreneurship and access to quality education for the most marginalized and impoverished children in the community could also have the potential of transforming global mental health by informing the development of evidence based effective low cost mental health initiatives that build on the existing strengths in the most troubled parts of the world. To introduce and scale up an innovative QualityRights intervention in mental health facilities.